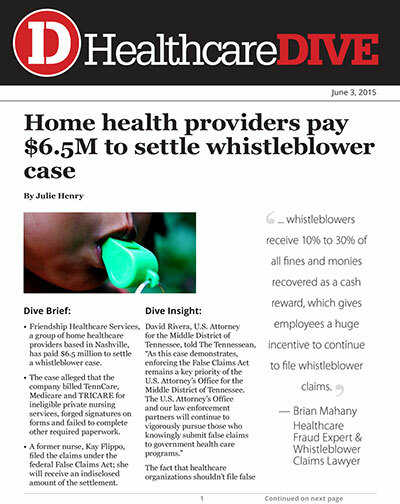 Friendship Healthcare Services, a group of home healthcare providers based in Nashville, has paid $6.5 million to settle a whistleblower case. The case alleged that the company billed TennCare, Medicare and TRICARE for ineligible private nursing services, forged signatures on forms and failed to complete other required paperwork. A former nurse, Kay Flippo, filed the claims under the federal False Claims Act; she will receive an indisclosed amount of the settlement. The fact that healthcare organizations shouldn’t file false claims is a no-brainer. But in many instances, these cases end up being settled because organizations don’t have the appropriate documentation to back up their claims. According to Brian Mahany, healthcare fraud expert and whistleblower claims lawyer, whistleblowers receive 10% to 30% of all fines and monies recovered as a cash reward, which gives employees a huge incentive to continue to file whistleblower claims. In other words, this isn’t the last time you will read about a case like this.